Imagine a beautifully-designed restaurant with a world-class chef who hasn’t yet made a name for himself. The short ribs are slow-cooked in an aromatic blend of herbs and spices. The butter chicken melts in your mouth. It’s hidden on a side street in a residential area that doesn’t get a lot of foot traffic. I get hungry just writing about it. But I wouldn’t be likely to eat there, because without any promotion, I wouldn’t know it exists. The same is true for a website. It can look stunning, be a breeze to navigate, and have thoroughly interesting content, but without the right promotion, nobody will read it—because nobody will know it exists. So how do you get more exposure for your website and make it bear fruit for your business? Let’s take a look at 10 steps you can take to help increase traffic and engagement. Think about your customers looking for a product or service like yours on Google. What keywords would they have to enter in the Google search bar to surface your company’s link on the list of results? Google actually has a number of free SEO (search engine optimization) and marketing tools to help you answer this question, including Google Trends and Google Adwords Keyword Planner. These will give you keyword ideas backed with data, and trends of what people are searching for on Google. You can see how much competition there is for certain search terms, so that you can find niche keywords, or longer combinations of words, known as long-tailed keywords, that give you a less crowded playing field and increase your chances of coming up higher in search results. This can help direct you to the right blog posts to write, and tell you which words you should be highlighting in your titles, meta descriptions, photo tags, and all throughout your site. If you’ve built your website using a website builder, such as Wix​​ or Weebly​​, you can take advantage of their built-in SEO tools that walk you through these actions, step-by-step. They’re designed to be easy to use for entrepreneurs that might not have digital marketing experience. If you don’t think you have the time or technical knowhow to carry out the above free steps, you can always look for search engine optimization freelancers to help promote your website effectively. SEO is too important to ignore—you don’t really exist on Google without it. No matter how good your SEO marketing is, you still may find that there are several entries above you on Google or other search engines. You may never have noticed it, but those are pay-per-click advertisements. Search for something random like, “Arizona tax lawyers,” and you’ll find that the first 4 Google results are ads, as are several of the entries on the bottom of the page. Those websites paid Google for better placement on search results. Using the same Google tools as you use for SEO, you can bid on keywords that vary in cost depending on demand. Every time someone clicks on your ad and goes to your site, you will be charged. But it may be worth the investment if that person coming to your site is potentially worth more money to you. Pay-per-click advertising can be complicated to do right. You need to know which keywords are worth bidding on, what to write on your ad to entice people to click, and what the landing page on your site should include once users click through. If you think it may be a worthwhile investment, but you’re not quite confident enough to try for yourself, there are firms and freelancers who specialize in PPC consulting (just search for them on Google). Do you ever look at people who are constantly staring at their cell phones and wonder what they’re looking at for hours on end? If not, it’s probably because you’re glued to your phone—as more and more of us increasingly are. And you know what the big attraction is: social media apps. If you know that so many of your potential customers spend so much time on Facebook, Instagram, Twitter and other social media apps, then you would be foolish not to try to meet them there and introduce them to your business. Not all social media channels will be relevant for you, for example LinkedIn may be more relevant for B2B businesses and Instagram may be more suitable for a B2C operation, but every website can benefit from some sort of social media interaction. You can get some free publicity by inviting your customers, friends and employees to like and follow your social accounts. Be sure to include your website’s URL in your profile and post regularly with links to your site included in the text. It may be worthwhile to invest in paid ad campaigns to grow your social media following initially. All of the various social media platforms have some form of promoted post that you can use to target people who you think can be potential customers. You can make sure you get the most out of your money by pinpointing who sees your ads by their interests and demographic profile. This is a good way of not only directing traffic to your website, but directing quality traffic to your website. Email marketing is an effective tool for introducing people to your website and for getting them to come back whenever you have a special promotion or must-see content. There are a number of email marketing platforms, such as Constant Contact, that can help grow your email list, craft visually stunning messages from customizable templates and make sure you’re not relegated to the spam folder. These are easy-to-use, drag-and-drop programs that don’t require any coding knowledge. For a new website, the challenge is getting people to sign up to your mailing list. You can promote it on your above-mentioned social media pages, entice people to sign up with contests and free giveaways, throw in-person events with a physical signup sheet or bowl for business cards, include an email opt-in on your invoices (with the promise of a discount for subscribers), or give rewards to existing subscribers who encourage friends to sign up. Once you’re in the door, you’ll have an excellent channel to deliver important news about your website to interested parties. This step goes hand-in-hand with several of the above methods to get people to come to your website. To get noticed on social media and email marketing campaigns, you need a strong brand identifier that will grab people’s attention, and that’s where your logo comes into play. Your website doesn’t stand alone—it’s just one of many channels that are part of your outreach to customers or readers. It’s important to have a professionally-designed logo that people will recognize on every platform associated with your business. Nowadays you have a number of options for finding someone to design your logo. There are traditional logo design firms, freelancer platforms filled with talented designers, and even AI-generated logomakers. You’ll have to invest a little money to get an effective logo, but it’s worth it if you want your website to stand out. Can you imagine Nike without its Swoosh? A key to having your site rank highly on search engines is showing that you have an active site that continually has updated and interesting content. How do you ensure a steady stream of new and interesting content? Add a blog to your website. There are a number of easy-to-use blogging platforms that can link right to your site. A well-written and interesting blog post has the potential to be shared by users, bringing new readers to your website. In addition, a blog gives you an opportunity for cross-promotion with other blog writers who are also looking to expand their audience. Have you ever been on one of your favorite news or entertainment websites and seen a side widget with “Sponsored Articles,” or a box of several articles with the header “You may also like” down lower on the page? This is a form of native advertising through content discovery platforms such as Taboola and Outbrain. It’s a way of advertising your content without giving the appearance of an advertisement. Your promoted content is presented like all of the other content on the site and it is impervious to ad blockers, because it is essentially part of the site. You’ll find this kind of advertising on the world’s biggest, most reputable websites, and you may have already unknowingly clicked on such an ad. It’s an unobtrusive way of advertising that can be a win-win for your website and the readers it brings. If you’re loathe to spend money to help spread the word about your website, it doesn’t mean there aren’t other ways to promote yourself with ads. When signing up with a web hosting service for your website, you’ll often be enticed with deal sweeteners that include free credits to advertise with Google and Bing. These promotions can be worth hundreds of dollars and you just might find that investing in such advertising is worth it going forward. Some of the leading website builders have similar offers for free ad vouchers. Check with your hosting company or website builder—you may have free advertising credits that you don’t even know about. Do you have products that you could potentially sell on your website? This could be merchandise connected to your brand, or even non-physical products, such as music or eBooks, that you can sell for digital download. Having products on your website opens you up to all new channels of promotion. For instance, you can send your merchandise to other sites or bloggers who review products. This is a collaborative effort in which you provide them with something to write about, and they provide you with publicity that leads back to your website. You can increase the likelihood that readers will come to your website by offering something free, or heavily discounted. So, how do you set up an online store on your website? Is it complicated? Do you need computer skills or technical knowhow? Absolutely not. There are a host of Ecommerce site builders that help you easily set up a store with no coding knowledge necessary. They can help you set up product pages, a shopping cart, and help you receive payments. Many of them even include powerful SEO features that will help you further promote your site. Let’s go back to our restaurant from beginning of this article. Let’s say an award-winning critic for the town’s main newspaper happened to stumble into your bistro and raved about your food in a column read by thousands of people. You suddenly find yourself having to contend with a mad dinner rush—dozens of people all showing up at once, ravenous with watering mouths that can’t wait to try the food they’ve read about. Now you have to deliver an unforgettable culinary experience to your diners —you have to find seats for everybody, and serve them promptly and courteously—and if you don’t, you will have squandered your opportunity. This also holds true for your website. You can promote a website endlessly, but it won’t survive and thrive if your pages load slowly, or if your site isn’t responsive and doesn’t display properly on cell phone screens. So, make sure that your hosting plan ensures your site loads properly and quickly. And make sure that your site looks just as good on mobile devices as it does on a laptop screen. You may even want to consider developing a mobile app for your site. Not only will a high-functioning site bring return visitors back to your site and make them spread the word to their friends, it will also help improve your SEO ranking. There are a number of ways to promote your website, some of which are free, and some of which require an investment. 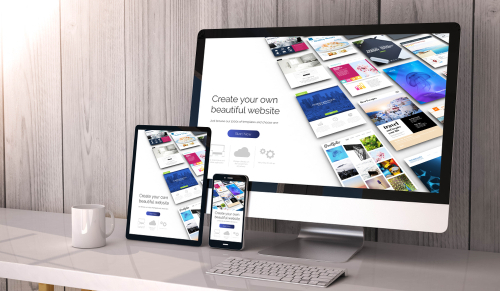 You’ll find it’s much easier to promote a site that looks good, is easy-to-use, and functions smoothly for users on all devices. If you’ve taken the time to build such a high quality website, then you should strongly consider making an initial investment in promotion as well. If you do it right, your website will get the large audience it deserves, and your business will be rewarded handsomely.